We've been having a sort of progressive metal renaissance these past few years. Not just in the number of bands or the quality of material, but in the growing success of the bands themselves. Opeth, Dream Theater, and BTBAM are enjoying quite a profitable time, possibly the first for the genre. This has afforded them opportunities that they couldn't otherwise do. In BTBAM's case, it has let them walk away from their old label, sign a new deal with the much more lucrative Metal Blade, and record a concept record split over two EP's. 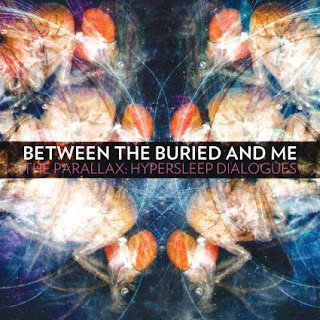 The Parallax: Hypersleep Dialogues is the first EP in an epic tale. It tells the story of two people communicating to each other through multiple dimensions. Their convos are effecting the universe, and if the tones of the songs are true, then they're really messing with the universe big time. The next EP will have the conclusion, and hopefully our protagonists will fix the problems they caused. The music itself is even more experimental than what BTBAM generally go for. You're gonna have your traditional metal moments, but things seem a bit more subdued so that the story can be told. At times, there will be points when it's just people mumbling over a horns section. Other times is grand orchestration. You can thank a lot of the sound to producer David Bottrill, who's pretty much worked with the who's who of progressive artists. With Bottrill producing BTBAM, that pretty much makes Hypersleep Dialogues a winner right out the door. The only complaint I have, and it's the same complaint I have with every EP, is that it leaves you longing for more. At only three songs, there's still a lot to tell to this deep story. Let's hope BTBAM don't keep teasing us forever for part two.